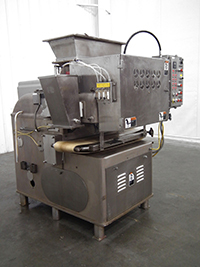 This type of equipment takes a large quantity of dough and divides it into pieces of equal weight and/or volume. Dividers are fed large quantities of dough into a gravity hopper where the dough is metered into the divider chamber or extruder, depending on the specific design. Dough dividers come in a variety of number of pockets, producing from 1 to 20 individual dough pieces.